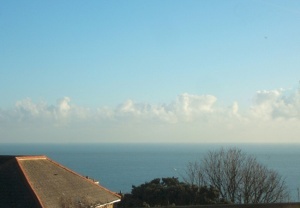 A very well presented top floor apartment in an attractive Victorian building with great sea views. 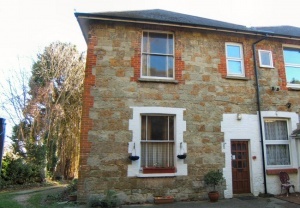 The property is located just above the town centre and offers spacious accommodation, with two double bedrooms, an open plan living-dining room, a lovely private garden with sea views and its own off road parking space. 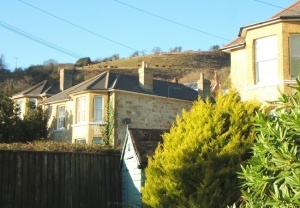 From Southgrove Road, driveway into the rear of Belmont House, parking area. 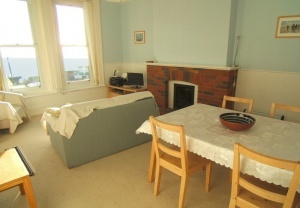 ENTRANCE HALL/LOBBY: 4� x 3�br />Doors to main living area and bathroom, cupboard housing fuses. 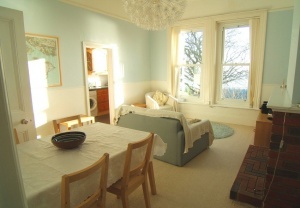 LIVING-DINING ROOM: 16�x 12�br />Two Upvc double glazed sash windows, south facing with lovely sea views. Brick fireplace with coal effect gas fire. Dado and picture rail. Space for dining table and chairs. 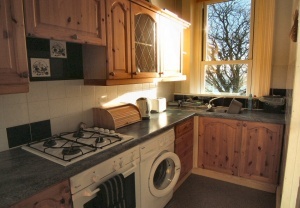 KITCHEN: 13�x 5�br />Upvc double glazed sash window with sea views. Further internal high level frosted window to bathroom. A fitted kitchen with a range of wood fronted base and wall units. Built-in electric cooker with gas hob and extractor hood above. Stainless steel sink and drainer with mixer tap. Space and plumbing for dishwasher and washing machine. Space and power for fridge-freezer. 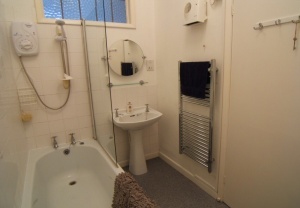 BATHROOM: 8�x 5�br />A partly tiled room with high level internal frosted window to kitchen. A white suite with panel bath and shower unit above and glass shower screen, pedestal wash hand basin, low level w.c., heated chrome ladder style towel rail, extractor fan. 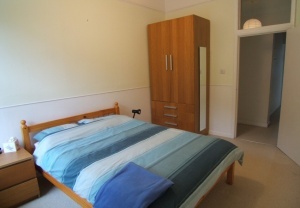 FURTHER HALL: 12�x 3�plus 12�x 3�br />Hall with electric storage heater and high level cupboard. 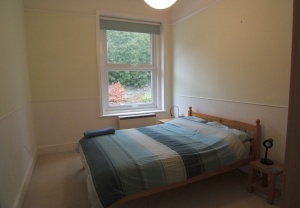 BEDROOM ONE: 12�x 9�br />A double bedroom with large window to rear with leafy views. Picture and dado rails, electric storage heater. 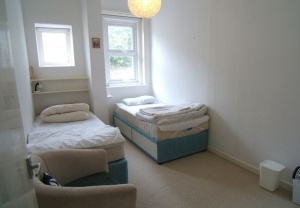 Another double room with two windows to rear (one frosted). 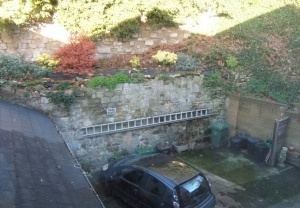 Large cupboard housing water tank and further high level cupboard. Electric storage heater. 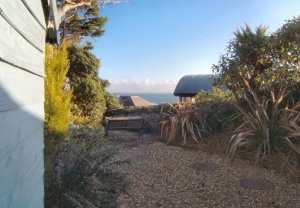 The apartment has its own private garden to the front of the building which is very well maintained and well laid out to maximise the enjoyment and sea views from this south facing space. 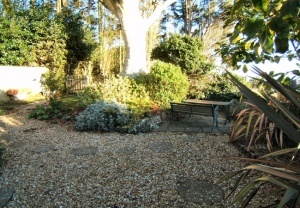 There is also a garden shed and plenty of areas to eat outside should you wish to. 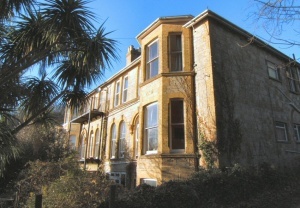 The driveway from Southgrove Road leads to the back of this attractive Victorian building where you will find hard standing parking for the apartment. 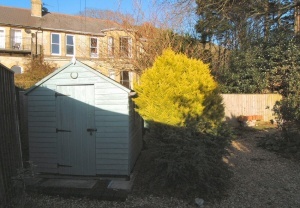 There is a further shed adjacent to this parking area.